Haymakers now have several options to bind round bales. The binding option chosen impacts the time it takes to bale a hayfield and the preservation of forage quality if the bales are stored outdoors. University of Minnesota researchers recently reported on the first-year results of a study comparing twine wrap to net wrap or B-Wrap. They shared their results at the American Forage and Grassland Council’s Annual Conference, which was held last week in St. Louis, Mo. 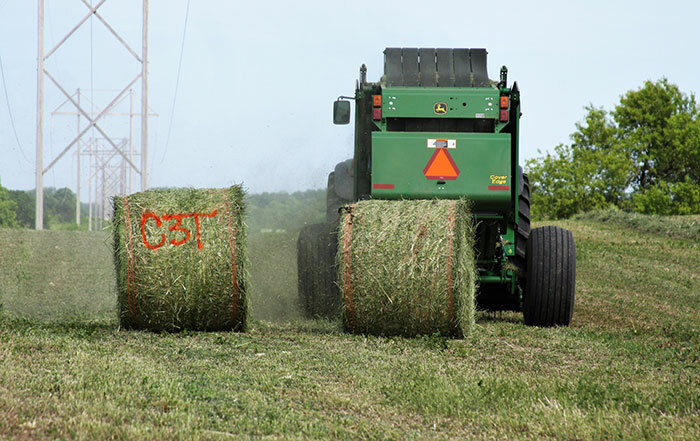 The researchers recorded wrapping time in the field for each wrap type, determined bale weights, and monitored forage quality in bales over a 12-month period. Hay cores to a depth of 18 inches were taken from the sides of bales at harvest and then every three months thereafter until the one-year storage time had been reached. The bales were stored outdoors on wooden pallets. Two different alfalfa varieties were harvested and evaluated, one of which contained the HarvXtra, reduced-lignin trait. A total of 24, 4- by 5-foot bales were harvested in June 2017 (12 of each variety, four of each wrap type within a variety). In the context of this study, net wrap took the least amount of binding time with an average of 18 seconds per bale. The B-Wrap was the next quickest at 28 seconds. Twine easily had the longest wrapping time with an average of 56 seconds per bale. During the initial year, no significant forage quality differences were measured between the two tested varieties for crude protein (CP), acid detergent fiber (ADF), neutral detergent fiber (NDF), and nonstructural carbohydrates (NSC). Therefore, results were averaged across the two varieties. Overall, dry matter losses were minimal compared to those measured in previous studies. Twine-tied bales averaged a 5.3 percent dry matter loss, followed by net wrap with a 4.9 percent dry matter loss. The B-Wrap bales exhibited 0 percent reduction in dry matter. The minimal amount of dry matter lost in the study bales can be partly attributed to storing the bales on pallets, which helped preserve the integrity of the bottom of the bale where high losses occur if the bales are placed directly on the soil surface. No significant differences between the three wrap types were measured for CP, ADF, or NDF following 12 months of storage time. However, the twine-wrapped bales had significantly lower NSC than either the net wrap or B-Wrap bales.